The official website for the previously announced TV anime Mix has launched and announced staff members. Noriko Hidaka, who voiced Minami Asakura from the prequel series Touch, was announced as a part of the cast. 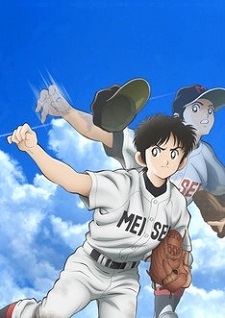 Officially titled Mix: Meisei Story, the anime will air on Saturdays at 5:30 p.m. via Yomiuri TV and Nihon TV system during Spring 2019, replacing Gyakuten Saiban: Sono "Shinjitsu", Igi Ari! Season 2 during the same time slot. To replace ace attorney timeslot is this, which means MHA gonna air summer or fall? Bcuz this anime could be 2 cour. "Odahiro Watanabe (Tokyo Ghoul:re series)"
And an okay character designer. If this is not a recipe for a mixed receptive staff then I don't know what this is. In all seriousness though, I don't know what to say about this but this is quite mixed as hell. Hopefully when a PV comes out it turns out fine but this is... kinda mediocre on its own. The manga is a grade A pedigree though which saves them a lot of effort. Yikes. Looks like I need to start watching 'Touch' soon.